Our heavy duty secondary glazing system is stronger and more robust than our other secondary glazing systems. The thicker frames enables it to take double glazed sealed units and achieve larger maximum sizes. Our heavy duty system is most commonly used in extreme circumstances, where single glazed secondary glazing is not sufficient enough to insulate and sound proof your windows. 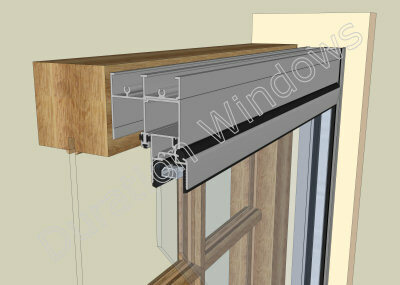 Heavy duty secondary glazing is available as either a two track horizontal slider or a balanced vertical slider. The system is a direct fix system that is installed into the window reveal, away from your existing windows, helping to provide maximum sound and heat insulation. The system can however take single glazed units if required. Direct fix system that is fitted into the window reveal. Can take double glazed sealed units and achieve larger overall sizes. Used in extreme circumstances where a single glazed secondary glazing, just isn't sufficient to insulate and sound proof your windows. A variety of glass types are available to tailor our secondary to your individual requirements; be it heat, noise or security that is your priority. If the style of secondary glazing that you require is not available in this system you may wish to check out our Economy Odd Leg system and Luxury Subframe system.